Micro Mag is a clean and minimal blogger template for review or magazine blog. First time from MS Design published a magazine blogger template for free. Earlier some days, we published a newspaper blogger template in our local language Bengali and that was: Songbad 71 - Bangla Newspaper Blogger Template (Premium). After that we now published a magazine style free blogger themes. If you looking for a simple, clean, minimal and responsive magazine blogger template then Micro mag is perfect for your blog. In this template we used top nav and drop down responsive main menu. In top menu bar used breaking news ticker. Micro Mag is a clean stylish review, blogging and magazine responsive blogger template that allows you to keep eyes on content including games, travel destinations, films, blogger magazines, technology etc. 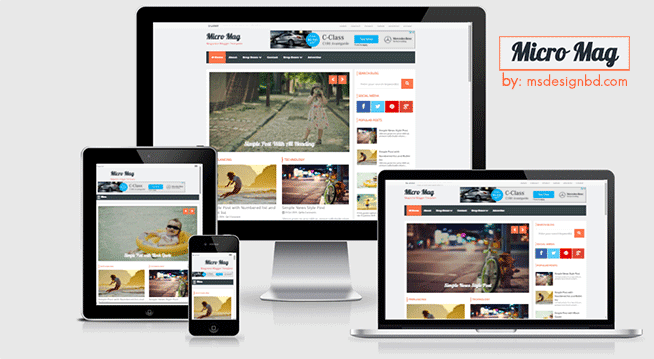 Micro mag is a premium magazine blogger template for technology blog.